Sputnik's Designers Didn't Fathom Its Impact Sputnik immediately captured the world's imagination with its beeps and its planetary shape, but it took days for the Soviet designers to realize the magnitude of their accomplishment. 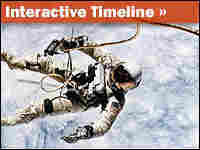 View a timeline of the Space Age. Fifty years ago Thursday, the Soviet Union started the Space Age by sending the first man-made satellite into orbit around the earth. Sputnik changed history when it went into space on Oct. 4, 1957, but its designers didn't immediately see the launch as a major accomplishment. The shock announcement on Radio Moscow spread alarm in the West that the Soviet Union was pulling ahead in technological development. "The first artificial earth satellite in the world has now been created. This first satellite was today successfully launched in the U.S.S.R.," the announcer said. The great Soviet achievement was made possible largely because of one man: Sergei Korolev, called the father of the Soviet space program. He started building rockets for the military after World War II. Beginning from scratch, he used captured German plans — because the United States had already snatched away the top German engineers. Soviet rocket designer Boris Chertok first met Korolev in 1945 and later served as his first deputy. Now a frail 95-year-old, Chertok is still incredibly lucid and remembers many details as if they had taken place yesterday. Sitting inside a museum now dedicated to his former boss, surrounded by photographs and memorabilia of the Soviet space program, Chertok says Korolev was not only a genius engineer, he was also a gifted organizer. "He had a great ability to persuade people. He also was exceptionally single-minded and ruthless with subordinates," Chertok says. "Deep inside himself, he felt a great responsibility not only to his people, but history itself." But Korolev almost didn't survive Stalin's Great Purge. He had been arrested in 1938 and spent six years in prison --partly in a Siberian labor camp where he lost all his teeth. After the war, much of the Soviet Union was devastated and people were starving. But Korolev succeeded in persuading Soviet leaders that rockets were worth funding because only rockets could deliver a nuclear warhead to U.S. territory. One Soviet writer, Vladimir Gubarev, observes how the Soviets beat the Americans in launching the first successful rocket. "It was utterly illogical that the Soviet Union should be first into space," Gubarev says. "But it happened, because unlike the U.S. rocket program, the Soviet one was more closely tied to the military." It took years of intensive work before Korolev's rocket-design bureau had a prototype ready to fly. Boris Chertok oversaw missile assembly at the new Baikonur Cosmodrome — on an isolated steppe in Kazakhstan, where he says conditions made work grueling. "[It was] sleepless nights, temperatures soaring to more than 120 degrees, dust storms [and] murky, undrinkable drinking water," Chertok says. "But I remember it as one of the happiest times in my life." In May 1957, the designers tested the first R7 rocket. It crashed. And a second prototype failed to launch. Only the fourth succeeded in becoming the world's first intercontinental ballistic missile. When the West failed to recognize the Soviet achievement, Korolev suggested sending a satellite into space. Within weeks, Korolev designed a basketball-sized sphere, which he called, very simply, Satellite Number One. It contained two powerful radio transmitters designed to emit beeps over the course of three weeks. Chertok says its shape was meant to capture people's imagination by symbolizing a celestial body. On Oct. 4, 1957, Sputnik I blasted off from Baikonur into Earth's orbit. Sputnik's beeps could be heard on radios around the world. But Chertok says that the team members were so focused on the military aspects of their work, they failed to recognize its historical significance. "We prepared the launch without any great expectations. If it were to succeed, [then] great. If not, no big deal," Chertok says. "Because our main task was to get back to building a missile capable of carrying a nuclear warhead." Chertok says the world's reaction to Sputnik caught even the Soviet propaganda machine by surprise. "As for Sputnik's creators, it took us four or five days to realize that from then on, the history of civilization could be divided into before the launch and after," he says. The names of Sputnik's designers would remain state secrets for years. Even inside the space program, the legendary Korolev was known to most only as the chief designer. Chertok says that caused him significant anguish. 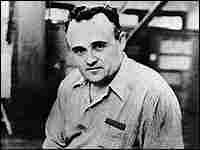 Korolev was also in charge of the effort that made Yuri Gagarin the first man in space in 1961. Still, Korolev was publicly recognized only after his death in 1966. Sputnik's launch prompted massive American investment in education and technology that eventually landed a man on the moon. Chertok says he was professionally jealous of the American achievement, but he was also exhilarated at the incredible technological advances his work on Sputnik helped launch.